MEGASAURUS! Really what more needs to be said? 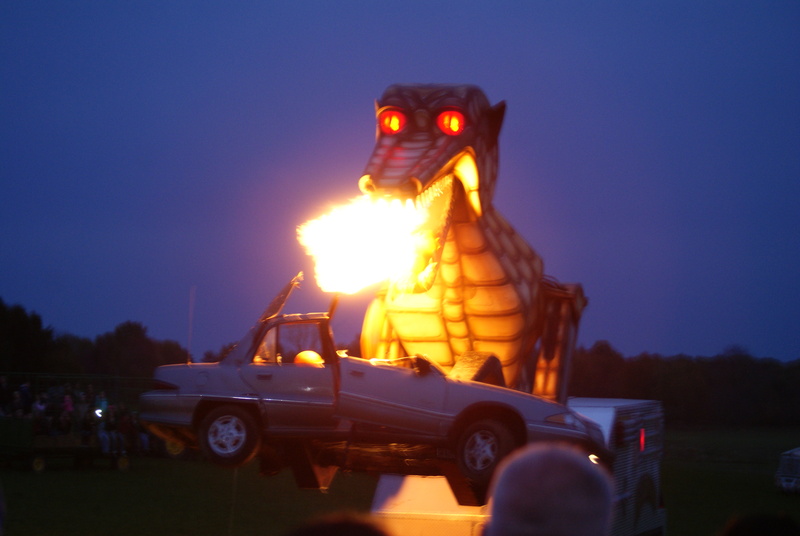 It’s a truck that transforms into a giant robot monster that breathes fire and eats cars. What does this have to do with pumpkins? Well, the good folks at Maize Valley Winery put pumpkins into the cars that are to be crushed. MEGASAURUS PUMPKIN PIE! There’s also an awesome pumpkin cannon. It shoots the pumpkins at a high velocity against a broken down van. Smashes it up real good. Then it shoots it far away into an empty field. No Punkin Chunkin here, it’s a full-on blast. In addition the winery and restaurant are open, they have a small farmer’s market (it sells a lot of pumpkins) and some fun activities for kids like hay bales, trains and so on. Today will be our third visit for MEGASAURUS. The above picture is from last year’s trip. Penny was a bit scared of it last year, but this year she says she’s not afraid. Also on the docket today is a visit to Stotler’s Orchard prior to Maize Valley. Apple picking is another fun activity that we do in Autumn. Maybe next year we will do 31 Days of Apples. The weather is looking great and we are all excited to get a move on. Hopefully later tonight or tomorrow I will have pics from this year’s visit up. Tomorrow morning we will have Pumpkin Cinnamon Rolls and Monday a Dinner with Pumpkin Soup.